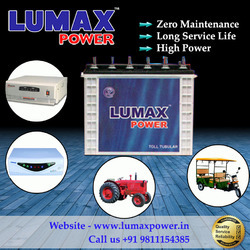 Lumax Power is providing our reliable Batteries for inverter, E- rickshaw, tractor, solar Power. We have been supplying the best range of Lumax Batteries in Greater Noida from years. We use advance Japanese Technologies in its manufacturer. That’s why it is best solution for your power backup related problems for Industrial and Commercial Places. We are the best Lumax Inverter Batteries Manufacturer and dealer in Noida and Greater Noida. Our Lumax Batteries has high efficiency means it has lower operating costs and high frequency. If you have any query regarding our services then feel free to contact us at the given address.